Virgil van Dijk and Joel Matip returned as Liverpool played out a 0-0 draw with Bury at the Energy Check Stadium on Saturday afternoon in their third pre-season friendly of the summer. The Reds were denied by three goal-line clearances from the hosts throughout the contest, with Daniel Sturridge, Sheyi Ojo and Dominic Solanke all seeing efforts prevented from hitting the back of the net by a defender. Bury, meanwhile, had a second-half attempt from Jordan Archer ruled out for offside as the clash ended without either team registering on the scoresheet. Liverpool travel to Blackburn Rovers on Thursday night for their final domestic friendly prior to their tour of the United States. Van Dijk and Matip made their first starts of the summer in defence, while Danny Ward and Harry Wilson were absent from the matchday squad. Jürgen Klopp elected to make 10 changes during the interval, with only Loris Karius remaining on the pitch from the opening 45. First-half team: Karius, Clyne, Van Dijk, Matip, Moreno, Milner, Fabinho, Jones, Ojo, Origi, Sturridge. Second-half team: Karius (Grabara), Gomez, Phillips, Klavan, Robertson, Chirivella, Woodburn, Keita, Camacho, Lallana, Solanke. Liverpool came into the game having struck 10 times in their opening two friendlies of the summer – and they nearly extended that tally to 11 after just seven minutes. Matip played an intelligent ball forward into the run of Divock Origi, who found himself one-on-one with Joe Murphy. However, his low shot was blocked by the goalkeeper. Matip then rose highest to plant a header from James Milner’s corner just wide of the back post. The Reds were exerting heavy pressure on their opponent’s goal, but Bury were holding firm. That said, the Shakers did have Adam Thompson to thank for keeping the scoreline goalless when he blocked from Sturridge just in front of the line after Alberto Moreno had sped into the area and pulled it back for the striker. Then, on 28 minutes, Bury were grateful to another block on the line – this time from Eoghan O’Connell, who chested away Ojo’s goal-bound curler after it had evaded Murphy. Shortly after, Ryan Lowe’s side almost profited from Alberto Moreno’s wayward back pass, which was pounced upon by Gold Omotayo, but although his touch initially took him beyond Karius, it also crossed behind for a goal kick. With 10 changes made during the break, Liverpool set about looking to break the deadlock with renewed vigour. And Bury were again grateful to a goal-line clearance when Adam Lallana and Solanke carved them open with a one-two, only for the latter’s swipe to be prevented from crossing the line by Will Aimson. 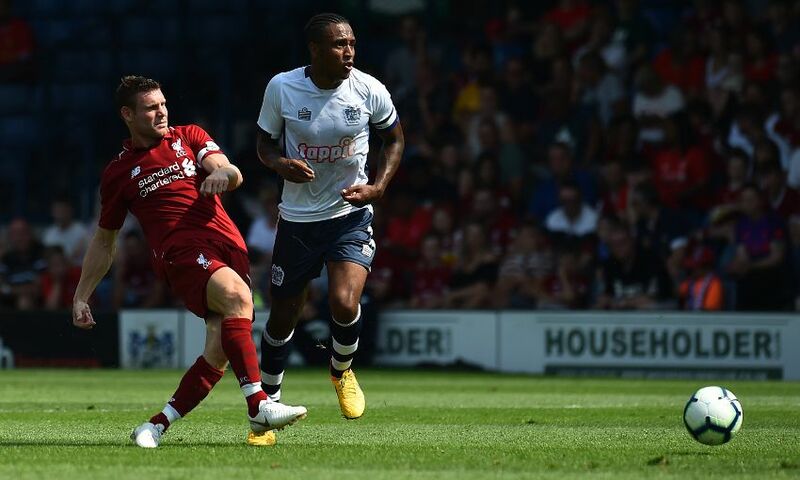 Next, Joe Gomez had a left-foot volley from a half-cleared corner narrowly evade the crossbar; however, the home team gave cause for concern when Chris Dagnall escaped in behind to go clear under pressure from Andy Robertson. Karius was able to block his initial strike, and Ryan Cooney scuffed the rebound against the outside of the post. Back at the other end, Ben Woodburn was left clutching his head in his hands when his first-time drive from Rafa Camacho’s pass was superbly tipped over the bar by Murphy. The Shakers’ stopper thwarted Lallana moments after. Kamil Grabara was introduced for the final half hour by Klopp, while Camacho snapped off target from Naby Keita’s lay off. Bury had the ball in the net when Jordan Archer tapped in from a free-kick, but the forward was flagged offside. Camacho could have won it for Liverpool in the 90th minute when the visitors broke after winning the ball deep inside the Bury half, but he was denied by substitute goalkeeper Mathew Hudson as the fixture ended without a goal.